Hansen’s interest was confirmed Wednesday by people with knowledge of the situation. They spoke on condition of anonymity to The Associated Press because no deal has been reached. One person said the Kings could sell for more than $500 million. The Kings’ future in Sacramento has been uncertain because the Maloofs and the city haven’t been able to come up with a long-term arena solution. Yahoo! Sports first reported the discussions between the Kings and Hansen. Yahoo! reported a possible sale could land the Kings in Seattle for the 2013-14 season where the team would play at KeyArena as a temporary home until a new arena is constructed. His counterpart in Sacramento thought the news anything but cool. 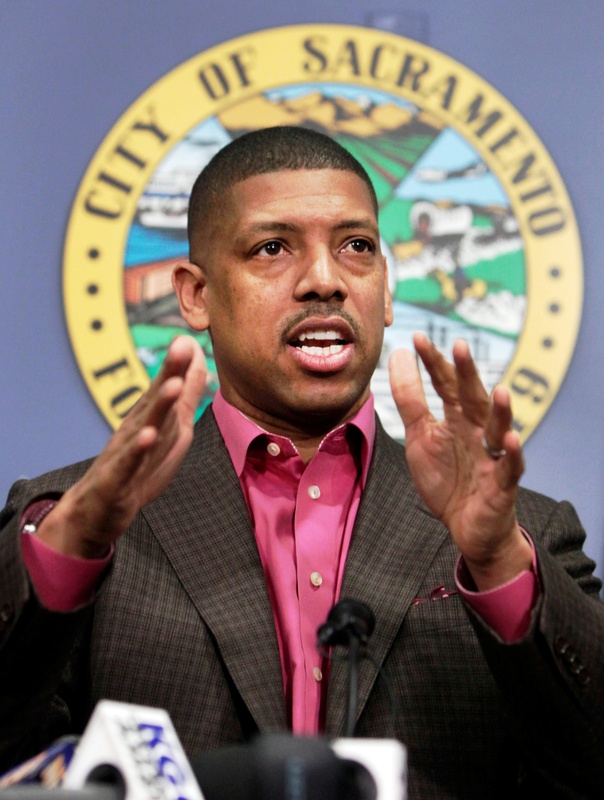 At an afternoon news conference, Sacramento Mayor Kevin Johnson said Wednesday was significant because for the first time Kings fans know the team is for sale. Johnson said he would do all he could to try to find a buyer with a Sacramento connection to possibly purchase the team and keep it in California’s capital city. Hansen, a Seattle native and San Francisco-based investor, reached agreement with local governments in Seattle last October on plans to build a $490 million arena near the city’s other stadiums: CenturyLink Field and Safeco Field. As part of the agreement, no construction will begin until all environmental reviews are completed and a team has been secured. Hansen’s group is expected to pitch in $290 million in private investment toward the arena, along with helping to pay for transportation improvements in the area around the stadiums. The plans also call for the arena to be able to handle a future NHL franchise. The remaining $200 million in public financing would be paid back with rent money and admissions taxes from the arena, and if that money falls short, Hansen would be responsible for making up the rest. Other investors in the proposed arena include Microsoft Chief Executive Steve Ballmer and two members of the Nordstrom department store family. Hansen’s goal has been to return the SuperSonics to the Puget Sound after they were moved from Seattle to Oklahoma City in 2008. Asked in September if he could envision a team being in Seattle for the 2013 season, Hansen was cautious about finding an option that quickly. The NBA had no comment. Representatives for Hansen did not return messages seeking comment. Any franchise looking to relocate must submit their plans to the NBA by March 1 and the move must be approved by the league. “As we have said for nearly a year, we will not comment on rumors or speculation about the Sacramento Kings franchise,” Maloof family spokesman Eric Rose said when contacted Wednesday by the AP. The Kings’ asking price would top the NBA-record $450 million the Golden State Warriors sold for in July 2010. Johnson said he’s had past discussions with more than one group about possibly stepping forward as owners if the Kings were up for sale. News of the discussions came a day after officials in Virginia Beach, Va., announced they were dropping their efforts to build a new arena. Virginia Beach was thought to be a relocation option for the Kings. The Maloofs backed out of a tentative $391 million deal for a new downtown arena with Sacramento last year, reigniting fears the franchise could relocate. Johnson and the Kings broke off all negotiations in the summer with the Kings saying the deal didn’t make financial sense for the franchise. Johnson made a desperate pitch to the NBA Board of Governors in April 2011, promising league owners the city would find a way to help finance a new arena to replace the team’s current outdated suburban facility. He also bought time by presenting more than $10 million in commitments for new advertising, ticket purchases and other financial support from regional businesses for this season. The NBA’s relocation committee, headed by Oklahoma City owner Clay Bennett — who moved the team now known as the Thunder from Seattle in 2008 — recommended that the league give the city a shot to follow through and handed down a March 1 deadline to come up with a plan to help finance an arena. Johnson delivered the agreement that March 1 to send the plan to the City Council. On the night of March 6, 2012, the Sacramento City Council passed a deal — brokered by the NBA and with Stern’s blessing — for a new downtown arena. A sea of supporters packed the grounds for the vote, which seemingly saved the Kings from relocation.